Nick wakes up in the medical center next to someone coughing up blood. When he heads outside the it's early in the morning but the area seems strangely deserted as though no one lives there. He wonders around and makes his way to a little girl, who is crying about her father. It's then he sees a group of people gathered by the wall. A man hands over his knife to Luciana as Alejandro watches. The community starts to chant, as the man exits the community through a school bus and faces a horde of zombies. Nick picks up the little girl and turns her away so she won't have to see the man get devoured. A look of disgust crosses Nick's face. Strand drives a truck and Madison bangs on the side indicating that he needs to stop. Madison hops off the truck and is joined by Alicia and Strand. It seems that they have spent the last two days looking for Nick. Alicia suggests that it's time for them to head back to the Abigail. Travis argues that there's water on the boat and points out that the truck is running on fumes. Finally, Madison agrees to the return. The people of the town are back to their normal activities and Nick wanders through them. A woman calls him over to help Don, who is not doing well. Alejandro comes over to treat the group of sick men. One man comments that he'll be leaving them soon but Alejandro tells him to wait it out before going to see Luciana. They've made their way back to the boat only to find it gone. Alicia suggests that they need shelter and is adamant that Madison has to except the fact that it's just the two of them now whether she likes it or not. To appease her mother, Alicia picks up a stick and the two of them write a note in the sand to indicate the direction they've traveled in. They pause outside of a hotel to consider how dangerous it would be to stay there and if it has any supplies. Nick continues to earn his keep and he is interrupted by Luciana, who says that they have work to do. Strand and crew make their way to a boarded up hotel and break in. Strand is the first to enter with the women cautiously following. Strand starts to ring the bell, alarming Madison, then snarks about the service being subpar. Luciana takes Nick to the bus the community exits from. Nick follows and Luciana and she orders him to follow and to stay absolutely quiet. After stabbing a zombie to a wall, they cover themselves with the walker blood. Luciana explains that she is taking Nick along because no one is going to miss him. Nick questions who will miss her and she replies, "the only one who would miss me is already missing". Strand and company make their way through the empty hotel. The come across the remains of a wedding reception and Ofelia talks about almost being married once. It seems the marriage didn't happen because she had to take care of her parents. Strand warns that the past will make her sick, before ordering Madison to help him find the kitchen. Luciana and Nick are now out on the road. Nick asks about the incident this morning and Luciana explains that those near death deliver themselves to the dead to protect the living. Nick asks what if her friend became lunch for no reason and she angrily asks him what is happening. It seems that Luciana thinks that what is happening is that the world is being washed clean and that when the dead go, the world will be purified. It seems that this logic originates with Alejandro, whom Luciana claims was bitten. When Nick questions this, Luciana claims to have seen it for herself. At the hotel, the kitchen is empty and Madison suggests going room to room. Madison is very anxious to keep Alicia by her side but Alicia walks off with Ofelia. Strand tells Madison to have seat so they can have a drink and when Madison refuses, Victor tells her that it's medicinal. Luciana and Nick make their way to one of a number of gangs and she warns Nick that they won't hesitate to end him. Marco stands and loads his weapon and Luciana places her knives at the ground at his feet. Luciana asks for water and hands over drugs in exchange. She is offered a cart and told that she can put whatever fits inside it. Luciana tries to negotiate for two carts but is denied. Luciana and Nick enter a large factory with shelves stocked with food. Strand makes Madison a martini and for the first time, Madison's accent slips and we learn that she's from Alabama. Madison, unimpressed with Strand's martini asks for tequila. Ofelia and Alicia are going room to room. Alicia finds a room key on the housekeeping cart but when she approaches a door a zombie begins to bang. They quickly realise that doors with do not disturb signs mark the rooms which contained the infected. They finally get into a room and manage to grab some clothing and a container of peanuts. In the bathroom they find a walker which is the remains of someone who hung themselves. It's Alicia who has to encourage Ofelia to keep moving. When they exit the room, Alicia flips the do not disturb sign, indicating to anyone else who comes that the room has a walker in it. Luciana and Nick begin to shop for water, vitamins and bandages. Nick picks up some treats and Luciana makes it clear that they are only to take what they need. Nick pauses to stare at some of the sick and Luciana rushes him along to help with the water. Alicia and Ofelia continue to empty mini bars and Alicia wonders why the man hung himself. Ofelia suggests that the man was tired of surviving but Alicia is adamant that you just push on. With tears in her eyes, Ofelia says that she is not going to make it and that her father was always one step behind hope. Alicia declares Daniel wrong, adding that if they lose hope they are dead. Alicia tells Ofelia that she has her and that they are family now. This doesn't seem to bring Ofelia much comfort. Done shopping, Luciana and Nick start to leave but Nick is tackled from behind. In Nick's back pocket the gang members find the treat. The gang prepares to chop off Nick's hand for theft. Nick says that if they don't let him go they will not be provided with anymore Oxy. It's Luciana who translates for Nick who points out that if the drug dealer's sister goes for one week without the drugs, they will pray the young woman to die. Nick also has the nerve to demand another cart of water. The thugs throw Nick to the ground in disgust but they do get another cart of water. Away from the thugs, Luciana stops worried that the thugs are going to follow them back to the community. She is not impressed that Nick called out the gang member though it lead to more drugs. Strand and Madison are now feeling warm from the booze and they talk about how in another life they could have met. Strand says that he would have talked about coming up in the world to impress her - anything but Tom. Strand admits to being a seducer of people, laughing, claiming that it would have been fun. A resigned Strand says that there's no Tom, Steven, world to talk about or even a damn bar. Madison admits that Alicia is right and that they are never going to see Nick again. Strand is certain that Nick is alive though. Madison says that Nick was born lost like his father and has been slipping through her fingers since birth. Madison believes that Nick has his father's darkness and that alone he will head straight towards death. Strand asks how Steven passed and Madison explains that Steven crossed the divider into oncoming traffic on his way home. Strand wonders if Steven fell asleep and it seems that's what Madison told the kids. Strand assures Madison that she was trying to protect them. Madison says that she keeps trying to save them and they keep dying over and over again, though she believes that Travis stopped that for awhile. Strand however believes that one can only live with these things and that they cannot choose. Madison points out that she chose to mother and now she believes that she chose wrong. Strand tries to take the booze away but Madison will not be separated from her drink. In frustration, she throws her glass across the room then pours another one, this time toasting to false hope before tossing her glass. Strand heads to the piano and starts to play though it is horribly out of tune and Madison continues to break glasses. In a leather shop, the zombies hear the noise and start to push against a glass door. Now clean from a shower, Alicia looks at herself in the mirror. She heads out to find Ofelia only to find her gone. Alicia approaches the patio in time to see a zombie fall off the balcony. The zombies have figured out that if they leap from the balcony, they are no longer confined. A panicked Alicia calls out for her mother and begins to search for Ofelia. Luciana and Nick have returned to the community. Luciana walks off and Nick sees the little girl from this morning and hands over the treat he stole. The little girl however isn't interested at first. Nick watches her eat with a smile on his face but doesn't get to enjoy it long because he is called away by Luciana. It seems Alejandro wants to see him and he explains he took the treat to offer the girl comfort. Nick is adamant that not everything can be about cake but Alejandro declares him wrong. Alejandro hands him a vile filled with saline solution which he injected the man with this morning. Alejandro says that they are running out of cake and medicine and so he has been offering them a placebo. Alejandro says that when the world is washed clean of death the faithful will remain. It's then that Nick sees the bite on Alejandro's neck. Alejandro makes it clear that if Nick ever puts the people in danger again, he will be fed to the zombies. Strand and Madison continue to make a ridiculous amount of noise. Finally, a drunken Strand notices the walkers and tells Madison that they need to leave now. The zombies make their way into the room. Alejandro is speaking to the people about life. Strand and Madison begin to fight the walkers. Alejandro talks about a great pilgrimage of the soul and how death will not take them. He's pretty much a cult leader. The community chants deliver us from death, deliver us from ourselves. Nick is entranced and begins to chant. Madison and Strand are completely surrounded by zombies. Alejandro declares that this is how it will be as long as he lives. Okay the minute Nick found the community the one thing that was certain is that something would be wrong with it. It's a standard fact of the The Walking Dead universe that any community will inevitably be fucked up and it seems like this one is no exclusion. Clearly, what Alejandro has going on is some sort of death cult. He has placed himself in a leadership position and from the last scenes, they clearly worship him. It's creepy as get out and it's only a matter of time before it all falls apart. Alicia has really come into her own; however, it feels in many respects like the calm before the storm. 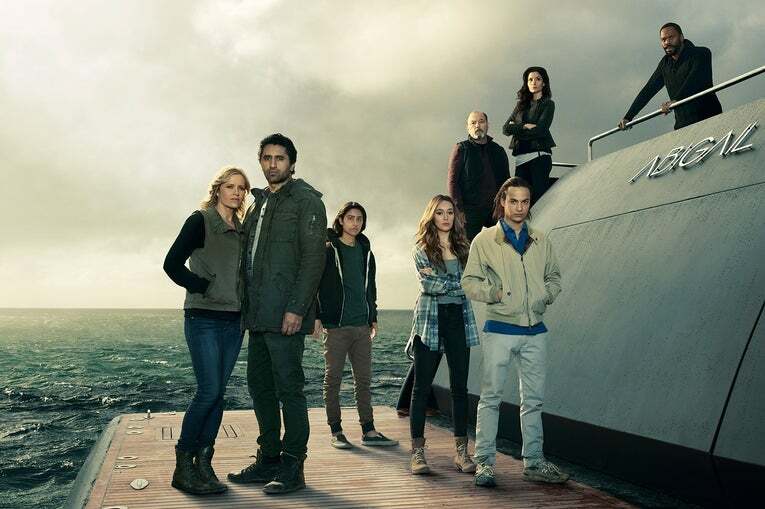 Alicia unlike anyone else talks of hope whereas Strand, Madison and even Ofelia all to some degree seem more resigned. Alicia is determined to put one foot in front of the other and to find some way to keep surviving. Alicia also displayed in this episode that she is a bit of a realist as well. Unlike Madison, she's only willing to devote so much time into looking for Nick. She sees Nick as someone who is lost. Madison speech about regretting her motherhood was very strong I felt. It's not very often that you see women admit in the media that they regret their decision to reproduce. Madison also talk about her husband's depression. It's telling that she thinks that this is what is wrong with Nick. We've heard all about his drug addiction which now seems like self medicating to me and it makes me wonder if Madison ever sought out mental health treatment for either her husband or Nick? She's been in savior mode for so long, I think she don't really think she sees the illness. It's not simply a darkness There's also more going on with Nick than hereditary illness because will genes might predispose someone, there are always other factors to consider. I really don't like the idea that depression is just passed along the same way that eye colour is for instance; it's too simplistic.